December 7th, the Nice List! Hello boys and girls…. well we’re in full swing here at the North Pole! Elves are building toys, testing toys, preparing Reindeer for the big trip and even compiling the ‘Naughty & Nice’ list…. Which brings me to todays point… How to get on the NICE list. Its really not that hard boys and girls. If you just do what your heart tells you, everything will fall into place. If you do something for someone else that YOU would like to have done for you – that is a great way to begin! Everyone likes to be told how well they do this or that…. so when you see someone do something that is thoughtful and nice or maybe they are doing well in school – TELL them how nice you think they are and what a good job they’re doing! It will make them feel good and YOU too! You can also help a neighbor who has trouble with chores around their house. Maybe raking leaves, shoveling snow or picking up their paper or mail. Remember, its always better to Give than to Receive! And giving to others makes you feel REALLY good!! It doesn’t have to be a gift either… like we just said, doing a good deed is just as good, if not better! Well, thats all for today boys and girls… I just heard Percival’s ‘Treat of the Day’ alarm!!! Harv, the Elves and I are going to hurry to the magic oven and see what awaits!! Till next time, do something to get on the NICE list!!! Merry Christmas!!! HO! HO! HO!!!!!! Its been a few days since I talked to you all but the truth is, Harvey and I have been ‘recovering’ from a good old fashioned snowball fight with all the Elves. We both have a sore arm and are pretty tired from all that fort building and dodging snowballs tossed our way! So….. I’ve been checking my list, at least twice – and catching up on my Holiday Movies. Last night we watched ‘A Christmas Story’. Luckily Ralfy didn’t shoot his eye out – again. Then we watched ‘Toy Story’ – again… I just love Holiday movies!! Percy even made us hot chocolate and fudge to snack on during the movies. Tomorrow we’re putting together electronics – things like iPads, iPods, iPhones, laptops, tv’s and video games. Our Elves have been working part time at Apple, Samsung, IBM, HP and Microsoft so they are very good at making and assembling all the fancy gadgets. Then of course, Harvey and I will have to test them out to make sure they are PERFECT for delivery to all you good girls and boys all over the Big Wide World!!! See you soon! Only 19 more days till Christmas!! It seems that a certain someone .. Harvey .. got a little rambunctious with Miss Peanut in the Toy warehouse during a game of ‘Chase’. It started like it usually does when Peanut wants to play. She will start to growl and prance around Harvey… then Harvey will either chase her or run from her and the Chase is on!!! This time they got to running like wild horses and knocked over a stack of board games the Elves had just finished. The boxes and pieces went everywhere and our head Warehouse Elf Jimmy, told them to take their horseplay somewhere else! Then they ran thru Reindeer Barn and startled the herd! The Reindeer were all excited and jittery, so our Reindeer Barn Elf Zippy told them to go somewhere else because they were interfering with the Reindeer’s rest. So they made their way back into the Toyshoppe and straight to Percy’s Bakery, knocking over a fresh batch of chocolate chip cookies just coming out of the magic oven. Percy was a little frustrated and told them to ‘skee-DADDLE’ or they wouldn’t get their treats later in the day. Finally, they hit the wrapping department where all the Elves were busy wrapping toys large and small. Harvey was chasing Peanut and just about to catch her when they hit the slick wood floor and THATs when it happened!! They both went sliding headlong into the looong roll of wrapping paper on the conveyer belt and and then got tangled up in the scotch tape line and all the presents went tumbling into the pile of paper, tape, ribbons, bows and of course Harvey and Peanut. When the dust settled, everyone was ok and we got a big laugh out of how they both looked. But, unfortunately some of the larger presents may not be wrapped this year. So if you get a present from Santa that IS or is NOT wrapped – don’t worry, it was just because of the Wrapping Paper Disaster of 2014 at the North Pole Toyshoppe!!! HO! HO! HO! HO! HO! So you see boys and girls, everyone makes mistakes!! But its best to learn and laugh about it. Keep being as good as you can!! Till next time, bye bye – and Merry Christmas!!! December 2nd – Snowy day and new Reindeer! Hello again from the North Pole Toyshoppe! 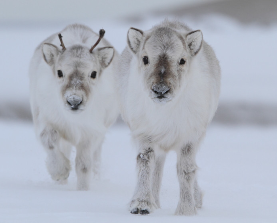 Its snowing pretty heavy here today and we’ve got 2 new little baby reindeer to care for. Here is Jingle and Jangle! They are very energetic – and hungry!! Harvey named the first one (a boy) Jingle. You know his last name is Jingles so he thought that would be fun…. and the second one (a girl) had to be close, so we named her Jangle. They were born only a few minutes apart and hardly ever leave each others sight. The Reindeer Barn Elves have their hands full keeping fresh hay in the stalls and feeding all our herd, especially now with 2 little ones. You boys and girls should think about how much care and attention little puppies and kittens need too. Its always best to ask mom and dad if they think you can handle all the responsibilities of taking care of these pets. They are a lot of fun, but they can also be a lot of work, especially when they are young! Its time to get back to work in the Toyshoppe…. we’ve got a lot of toys that need to be assembled today and tested later this evening. Thanks for stopping by!! See you soon!! HO! HO! HO!!!! Thanksgiving over – Its December 1st!!! Ohhhh My! boys and girls……. I hope you had a ‘filling’, safe and Happy Thanksgiving!! Harvey and I sure did…. Mrs. Claus and all the Elves in Percivals’ bakery prepared a feast fit for a King! And we ate till we couldn’t eat another bite!! We had turkey, ham and roast beef – creamed corn, brown sugar carrots, green bean casserole, candied yams, mashed potatoes and gravy, dressing, cranberry sauce, fresh bread, dinner rolls and of course a wonderful selection of pie! There was pumpkin, pecan, cherry, apple, peach, chocolate cream, banana cream and even coconut pie. Of course that was for Harvey and the Elves … I’m not a fan of coconut as you may know! HO! HO! HO!!! Well, after a feast like that we all took a nice looong nap while the football games were on the tv!! That’s the best way to watch football you know! Ho! HO! Then we woke up and played cards and board games for a while. Harvey always wins!! Then it was time to cut down our Christmas tree for the season. Harv and I went out into the snowy woods just south of the Toyshoppe and found a beautiful 12 foot tall Spruce that is now standing in the middle of the Toyshoppe! The Elves and I and Mrs. Claus were decorating the tree till the wee hours and then we finally went to bed. That’s all for now boys and girls!!! We’ll write again soon… be good!!! Bye-bye – HO! HO! HO! … bye-bye…..
November 21st – Santa’s getting Ready! Hello Boys and Girls!! I hope you had a fun fall! Halloween has come and gone and Thanksgiving is right around the corner! I’ve got to be going now, the sleigh is getting waxed and tuned up for tomorrow. I’ll talk to you all again soon! Bye Bye!! HO! Ho! Ho!! !